This has been one of the most anticipated movie ever since the trailer was out in late 2016. However, when the movie was released, I’ve been seeing quite a few pretty lacklustre reviews. I was almost going to give this film a miss when my fellow Bruneian movie partner Rano came to Singapore and invited me to catch this film. I was glad I did. 23 different personalities. This is a big challenge for any actor, and definitely a great learning opportunity for the rest. What interest me was to check out how James McAvoy and M. Night Shyamalan differentiate each personality without confusing the audience. Split did not disappoint. The director did not try to be ambitious by showing all the two dozens. He focused on the few personalities which are important to the plot while briefly showing the rest via self-recorded monologue. There’s the obsessive-compulsive maintenance man Dennis, playful, 9-year-old Hedwig with a lisp, chilling British Patricia, New York fashion-designer Barry and of course, the kind and harmless Kevin. Each personality dressed distinctively, speaks differently, had different body language, facial expression and it was almost impossible to mix them up. Despite having three kidnapped victims, only Casey (Anya Taylor-Joy) performed above expectation. Popular Claire (Haley Lu Richardson) and Marcia (Jessica Sula) had a good start with their loud characters, but they never managed to perform beyond the hysterically frightened victim-role to the point where I simply just mixed up the two of them and forgot who’s who (despite them having different skin colour). Anya Taylor-Joy had an advantage by having a contrasting character. Casey is quiet when her two friends were chatty. The director allow the character to reveal her vulnerability and secrets in nibbles, through words and actions, enough for anyone sensitive to notice, and provide a element of shock for those who did not realised her backstory. My favourite part about this film was how it was balanced with three storylines. Besides the main timeline between the kidnapper Dennis (or Kevin aka James McAvoy) and his three victims, there’s also the childhood flashback story of young Casey where she learns shooting with her dad and uncle, as well as the fractured tandem of Kevin and his psychiatrist Dr. Fletcher (Betty Buckley). 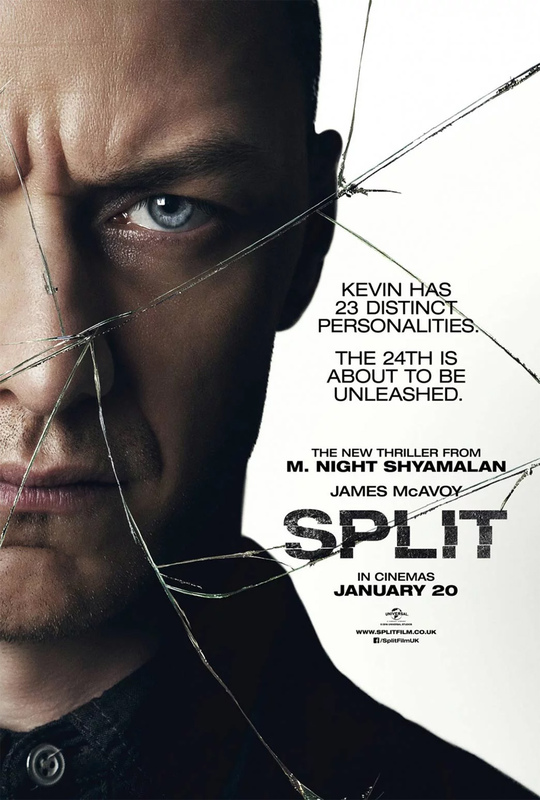 While the interaction between the shrink and the different personalities of Kevin took place in a plain room, it is also the differentiating factor between this film and other thrillers which touched on split personalities. Dr. Fletcher provides insights that allow the audience to view Kevin as a human being with a traumatic childhood rather than a psychotic with a fractured mind. Her beliefs on how dissociative identity disorder is actually a reflection of the brain’s vast potential rather than a disability, as well as their many conversations together provide answers to the purpose of the kidnap. If you think I’m spoiling the movie by sharing the above information, I can assure you there are plenty of surprises left to go. Take some time to enjoy the movie which balanced sympathy and fear, and I believe most of you would enjoy it. Writer/director/producer M. Night Shyamalan stated that shooting this film was the most challenging of his career. This film is also his longest movie to date. It is also the first film Shyamalan used a different composer other than James Newton Howard since Wide Awake (1998). M. Night Shyamalan stated that he hired cinematographer Mike Gioukakis after seeing his work on It Follows (2015) and composer West Dylan Thordson after hearing his music on the TV show The Jinx: The Life and Deaths of Robert Durst (2015). Joaquin Phoenix and the production couldn’t reach a contract agreement and James McAvoy was cast in the lead. Which was just as well as I did’t really enjoy The Master. Split is a thematic sequel to Shyamalan’s 2000 film Unbreakable. Bruce Willis reprises his role as David Dunn from Unbreakable (2000) at end of the movie. The director revealed that the character of Kevin (James McAvoy) was originally one of the villains in an early draft of Unbreakable, but he was soon excised from the script entirely because there wasn’t enough room for him alongside David Dunn and Samuel L. Jackson’s Mr. Glass. Check out SPLIT (2017) Movie Official Website and Facebook Page! SPLIT (2017) Movie is out in cinemas on 19 January 2017. Its an interesting plot and storyline, going to catch this movie later this weekend. Thanks for sharing. Very interesting! I wanted to watch this movie immediately after the release but hubby out of SG so missed it. I have watched some of Shyamalan’s movies. Generally some are hit and some are miss. I have not read your review at all because I do not want see any spoiler. Ever since I saw the trailer it got a lot of my attention. I think that the work made by the actor is worthy of an Oscar. Oh I have not shared my review of this film with the group yet, I should. It was indeed an acting showcase for James McAvoy. I liked seeing Betty Buckley on screen again. I am happy that M. Night Shyamalan is finally back on the right tracks after his continuous series of duds in the past 10 years. Multiple personality disorder can really make an interesting plot. Hats off to the actor for portraying the role. I love psychiatric films. I really don’t like Shyamalan though. That’s after he ruined my favorite series with his film, “The Last Airbender”. I might as well check this out when there’s nothing good to watch.